Any other kids doing any racing? Little by little I am working my way up. I am now tied for 10th in the points for my hare scramble series out of 42 riders. I finished 13th out of 36 riders this week. Ten miles of trail, quarter mile straights through the corn field, we had to regear for the flat out sections. More water crossings than I could count on one hand. Only one fall but it was in the muddy water on the last lap. My 150R is running great, but the kid on the 100F still beat me through the first three laps. He is fast, but wants a new bike. I let him ride mine, guess what he wants for Christmas. Tell us your stories. Re: Any other kids doing any racing? That's Awesome keep it up!!! Great job, did anyone get any pictures of you to post? I really want to but my parents probably won't let me because of softball. I played baseball for 9 yrs. I started T-ball at 4 and did the whole Little League World Series thing. My dad calls me a lazy gifted athlete. I just didn't like it enough to practice to get better. When January came around this year the folks asked if I had found a team or if I wanted to play baseball this year. In prior years we started practice in Jan. I explained that I liked riding motorcycles more and although it cost more, that is what I wanted to do this year. My dad commented today that I am finally doing something I like enough to practice. I ride every night if only to warm it up. Oh cool ya ive been playing softball since i was like 7. I just turned 14 on march 6th and i am on a team with 17 and 18 year old girls and it is really fun . 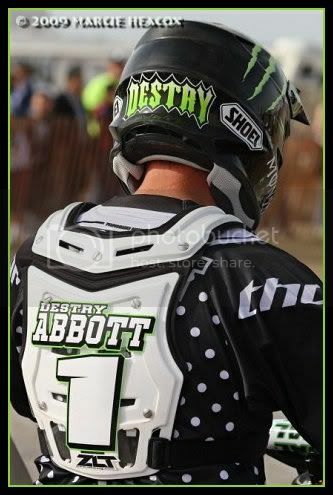 I love dirtbikes and softball but i think i love softball more, i would like to try a desert race. I do mx and this will be the third year I will be racing. I'm pretty good but can still use more practice like everyone. Luckily in the summer I get to ride 2 or 3 times a week and race 1-3 times a month. in the series I'm racing I'm in 1st in points. only by 2 points. I've been in 1st the entire series. 1 race left.